Hi! My name is Mike Corr and I am the Dad to two great kids – Anna, 22, and Aidan, 19 – who happen to have cystic fibrosis. Both of my kids fight their disease continuously in ways that epitomize their personalities. Right now, we are so close to fully managing – or even curing – the disease, so I firmly believe we need to continue with the full court press and do everything possible to fundraise. I can’t personally cure the disease for my kids, but I sure can go out and raise money and awareness about cystic fibrosis with Team Boomer. So far, I have competed in Ironman Wales, Ironman Mallorca, Ironman Miami, SACTS Mombasa Kenya Dualthon, and the Fine Stretch of the Legs Challenge in New Jersey. 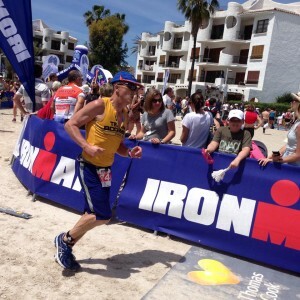 But my favorite Team Boomer memory is Ironman Wales. After a tough day, I came across the finish to hear the commentator saying, “…raising funds through Team Boomer to find a cure for Cystic Fibrosis – Michael Corr.” And of course when my little girl, Anna, registered for Boomer’s Cystic Fibrosis Run to Breathe in Central Park, I couldn’t have been more proud. If I could give other Team Boomer athletes advice, it would be to never be afraid to ask people and companies to make donations to the cause – to never be embarrassed about it. At the end of the day, it’s a numbers game. The more people we ask, the more people donate, and the faster we beat cystic fibrosis.